Two articles in, and I haven’t even discussed the team I’m here to represent, the Chicago Cubs! If I can’t do that, why am I even here? So, let’s get down to business. The Cubs sent Derrek Lee off to Atlanta a few weeks back, gaining a return of a few pitching prospects that some minors expert can analyze. Derrek Lee was traded to the Braves at the July trade deadline for Robinson Lopez and two other prospects. What I want to focus on is how this will affect the Cubs for next season. As of now, Cubs fans have been getting a steady diet of Xavier Nady at first, with a dash of Micah Hoffpauir on occasion. We’ll ignore the five games Captain Quad A has manned first and focus on Nady to start. Nady’s defense definitely hasn’t been great. He has posted a -0.8 UZR, not terrible, but bad considering he is replacing the +2.1 UZR Lee was posting this year (along with a career +7.3). Nady has never been much of a defender (his career UZR at his primary position of RF is a -12.7). As a hitter, getting the regular playing time at first has helped him a bit. He’s hit .289, but his lack of pop (.141 ISO at first) makes putting him on a team as an everyday 1B is a mistake. Without a serviceable option in the minors, the Cubs are going to have to look outward into the free agent pool this winter, in the hopes of finding a new (or old?) 1B. Rather than spend ten pages going through all of the mediocre free agents (Lyle Overbay, Mark Katosay, Troy Glaus) or covering the bases with every trade option (Yonder Alonso, Chris Davis, Alex Gordon, etc. ), let’s stick to the big boys: Lance Berkman, Derrek Lee, Adam Dunn, and Carlos Pena. The Cubs have a lot of money coming off of the books from Derrek Lee and Ted Lilly, so those funds need to go somewhere. The question is: where do they go? First up, we’ll tackle the former Cub Derrek Lee. While he has always been a fan favorite and an outstanding defender (see the aforementioned UZR totals), it would be tough to see him back. His numbers were way down after a strong 2009, and he vetoed a trade to the Angels once. It makes me wonder if Cubs management basically a) begged him to leave to get some return on their investment, or b) told him to get lost because they were letting him walk either way. The defense and clubhouse presence would be nice, but the team needs some offense, and I cannot help but wonder if the man exited on less than ideal terms (and he probably wants to play for a sure-fire contender at his age). Lance Berkman has an option for next year. At $15 million, it is a very pricey chunk of change for a man who has put up a 97 OPS+ as a Yankee and has been in steady decline for a couple of years now. Instead, look for him to get bought out by the Yankees (and watch the $13 million saved go towards Jeter’s salary). Defensively, he could be the piece the Cubs need to replace Derrek Lee. His UZR this year is a +3.8, even higher than Derrek’s +2.1. Still, he is a less than reliable hitter now, and I have heard nothing to indicate that the Cubs are looking at him. Personally, I think going after a guy that plays solid defense and can hit around .280 with an OPS over .800 would be splendid, but–as I said before–there are no signs pointing to this match. Then we have the cream of the infield crop, Adam Dunn. Dunn has always been known as a masher with a glove of stone, and he still is, but his defense is less like that of a black hole this year, raising his UZR from a -14.3 to a -1.9. His hitting is still fantastic, though. His SLG is up a bit, but his OBP is way down (due to a drop in walks from 116 to 67 thus far), leading to a 13-point drop in OPS. The problem in signing Dunn is the money. Even a deep-pocketed team with a lot of free money like the Cubs would struggle with taking his deal on. Although Adam Dunn would be the Cubs' #1 choice, his asking price is too steep for their taste. His demands will likely sit in the 3+ years and $15 million+ range, and the Cubs are already trying to fix the messes of Carlos Zambrano and Kosuke Fukudome. To pile on, they will still be stuck with Alfonso Soriano’s ugly mistake until 2014, so taking an aging hitting machine is a risk, even one as consistently powerful as Dunn. This leads us to my personal preference, Carlos Pena. That’s right, folks, I prefer the 33-tear old first baseman with a sub-.200 average. Why? Several reasons. First off, the walks. He may sport a saddening .203 average, buy his on-base percentage is still a useful .330, crazy for a guy to manage that, huh? His power is another bonus as well. Fans and critics have begged for a power bat from the lefty side for years (Dunn could work, but the money hurts). 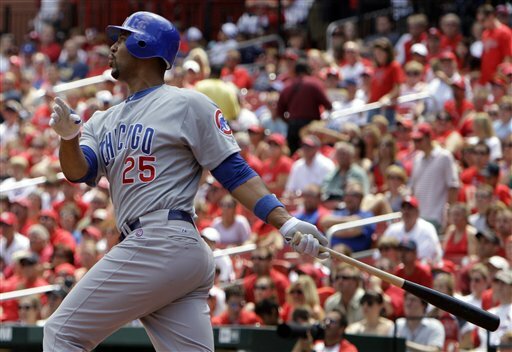 Although Pena sports a mediocre .203 batting average, his power numbers and and strong BB% could help the Cubs in 2011. He should be good for about 30-35 home runs for a few more years, and that would help to break up the monotony of Byrd, Ramirez, and Soriano. Of course, the man is far from flawless. His average is a mess. Even his career average is a weak .242. His defense has been suspect for a couple of years now, and one does not typically have a spiritual awakening with the glove at age 33. The final reasoning I prefer Pena to the other options is probably the most important: the commitment. I expect Carlos Pena to take the Adrian Beltre route next year. He will look for a reasonably priced deal for 2011, and will in turn try to restore some value to his stock before looking for one last multi-year deal before 2012. His price tag should sit in the $5-8 million range, and that is more than reasonable for a power bat at a position the Cubs desperately need production. Grabbing Pena would allow them to look for a prospect to groom for a year or two (maybe the Red Sox would send them Lars Anderson? ), while not costing them the entirety of their offseason budget. This way, the Cubs can look to fill the other holes they have this offseason: the back-end of their rotation and the bullpen. This afternoon, the Chicago Cubs traded first baseman Derrek Lee to the Atlanta Braves for minor league pitchers Robinson Lopez, Tyrelle Harris, and Jeff Lorick. This post will not detail the prospects that the Cubs got in return. Instead, I will try to gauge just how valuable Derrek Lee might be for the Atlanta Braves. Lee is in the midst of a terrible season, but his career numbers say he can rebound. Lee is in the midst of a very bad season. He is currently sporting a triple slash of .251/.335/.416 for an OPS of .751. This results in a wOBA (weighted On Base Average) of exactly .330. For a first baseman, being average offensively just doesn’t cut it. Lee is a good defender and always has been. However, even his above average UZR (Ultimate Zone Rating) can’t save his mediocre effort thus far with the bat, as he has been worth 1.1 wins above replacement for the Cubs this season. If Lee finishes his season as is, it will be his worst full-season since 1998. Since Lee has had a very good track record and is still not that old at 34, he still has a good chance of rebounding for the Braves. A good example of a first baseman having a great year at age 34 is Paul Konerko. Konerko is currently having the best offensive season of his career and if he keeps going at this rate, he is set to finish with a wOBA above .400. So a bounce-back by Lee is definitely possible. But to what degree will he rebound? This is when projection systems such as ZiPS come into play. Projection systems take a look at a player’s past performance, his age, his current season performance, and numerous other variables to come up with a projected line for the rest of the year. ZiPS Rest of Season thinks Lee still has a lot left in him. They project a line of .280/.360/.477 from D-Lee, resulting in a .365 wOBA. Lee’s hitting line in August shows that this estimate is definitely possible, as he is mashing with a .446 wOBA in the month of ‘dog days’. If Lee posts a .365 wOBA and a 1.3 UZR for the rest of the year like he is projected to, he will contribute 1 WAR for the Braves. 1 WAR in about 40 games is definitely a noteworthy contribution. But this means nothing if we don’t know what the Braves already had at first base. Glaus has been in a huge slump since July. 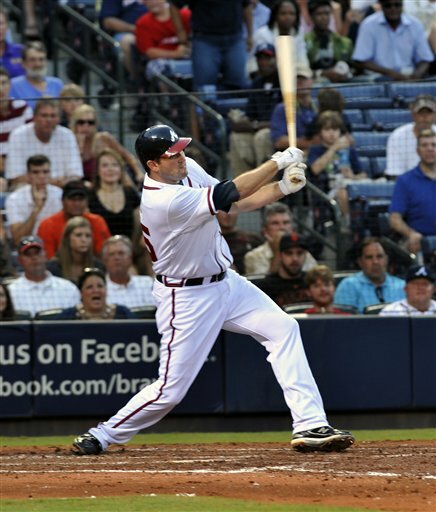 Before this trade, the Braves were using Troy Glaus at 1B. Glaus was having an acceptable season before July. However, he’s hit .182 and .208 in July and August. Those putrid numbers have resulted in a cumulative OPS of .749. More or less, Lee and Glaus have been equally mediocre to this point in the season. But, since Glaus has been slumping, ZiPS projects Glaus for a .342 wOBA. On top of that, Glaus is a horrible defender at 1B. He’s been worth -8.1 runs so far while Lee has been a +2.6. The difference between the two’s defense is a whole win. Due to this, Glaus’ projected WAR for the rest of the season is a measly -0.2. So while Lee may be a valuable player for the rest of the season, Glaus will most likely be a replacement level player, if not worse. The difference between the two is about 1.2 wins. Those 1.2 wins may be a huge difference since the Braves are in a tight division race with the Phillies. As we have seen with the AL Central in the past two seasons, one game can decide everything. Without looking at what the Braves gave in return for Lee, the deal definitely looks like a win for Atlanta.